Bangladesh has two very serious suitors now – India and China. Both are pouring massive amounts of financial and material aid into the strategically located country at the northern end of the Bay of Bengal. China has invested $ 13.6 billion and has pledged $ 24.5 billion up to now and India has given $ 2 billion and has pledged $ 5 billion, in the hope that Bangladesh will serve their respective strategic interests in the South Asian and Indian Ocean regions. Bangladesh has accepted the bonanza totalling $ 46 billion, though there are deep reservations in the case of Indian aid due to historical experience and geographical proximity. Chinese aid, on the other hand, is seen as being entirely benign. Being part and parcel of Bangladesh’s internal politics since its creation in 1971, India is seen in Bangladesh both as an asset and a hindrance depending upon which side of the political divide the viewer is in. China on the other hand is seen as being politically neutral in the context of domestic politics, and as an asset for checkmating India and getting concessions from it. The current Bangladesh Prime Minister, Sheikh Hasina, has another rationale for accepting Chinese aid. She feels that the rapid development of Bangladesh with aid from any country, including China, will put money into the pockets of ordinary Bangladeshis, and that, in turn, will create a good market for products from abroad, including India. Her plea is that Chinese aid to Bangladesh poses no threat to India. It creates a market for Indian goods. During Hasina’s 7 to 10 April visit to New Delhi, Indian Prime Minister Narendra Modi expressed India’s readiness to meet the future needs of Bangladesh in education, health, skill development, energy, infrastructure, science and technology, information technology, e-governance, and other emerging high technology areas. 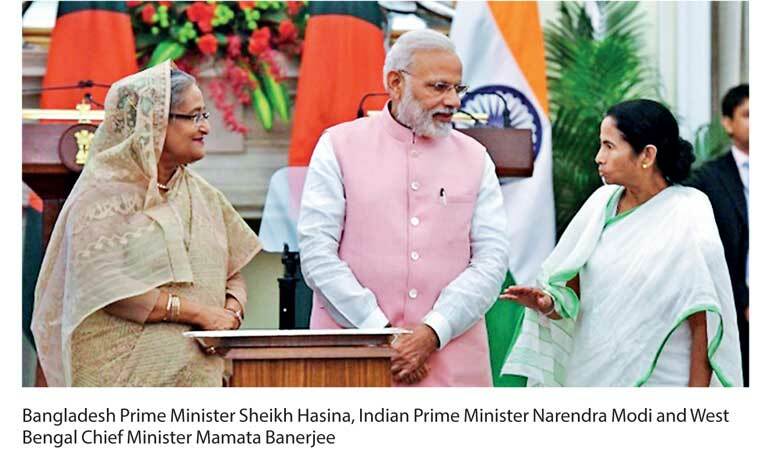 In a joint statement, Modi and Hasina noted with satisfaction the “excellent progress” made in the utilisation of the first line of credit of $ 862 million, as well as in the identification of specific projects for the second Line of Credit (LoC) amounting to $ 2 billion extended by India in 2015. They noted that many of the projects under the first LoC have already been implemented and have helped enhance capacities in the transport sector. Roads, railways, bridges, and inland waterways have been built. A number of new projects in the areas of port construction, railways, roads, airports, power and energy, telecommunications, and shipping are to be implemented under a third Line of Credit totalling $ 4.5 billion. To enhance Bangladesh’s defence capability, through training and purchase of new weapons from India, New Delhi has extended a credit line of $ 500 million. The total Indian aid to Bangladesh is now about $ 8 billion. Modi and Hasina were on the same page on Jehadi terrorism and Pakistan. Indian Opposition Leader Sonia Gandhi praised Hasina for putting down terrorism with an “iron fist”. Modi was happy that Hasina had broken away from the Bangladeshi practice of not acknowledging the role of the Indian armed forces in the creation of Bangladesh in 1971. While in Delhi, Hasina honoured 1,661 Indian soldiers who had died in the liberation war against Pakistan. On its part, India enhanced schemes to help Bangladeshi freedom fighters. Modi announced a special medical scheme under which 100 “Muktijoddhas” (freedom fighters of Bangladesh) will be provided medical treatment in Indian hospitals every year. He extended the Muktijoddha Scholarship Scheme for 10,000 heirs of Muktijoddhas for another five years. He also announced five-year multiple entry visas for the freedom fighters. However, three issues could sour Indo-Bangla relations despite Delhi’s multi-billion dollar largesse: The first and foremost is the sharing of the waters of the 54 cross-border rivers, specially the Teesta. Twenty-one million people in five Bangladeshi districts depend on the Teesta for their daily bread in contrast to eight million in West Bengal (India). The second is the defence deal which, though harmless on the face of it, is seen by nationalists in Bangladesh as an invasion of the independence and sovereignty of the country in the vital area of national security. And the third is the yawning trade gap between the two countries. As per 2015-2016 figures, India exports $ 5.5 billion worth of goods to Bangladesh, and in return, buys goods worth only $ 682 million. Bangladeshi goods face non-tariff barriers in India such as quality controls and quantity restrictions. The critical economic and political issue of river waters sharing was kept pending by India during Hasina’s visit, on the plea that it is “work in progress.” Modi is finding it extremely hard to convince West Bengal Chief Minister Mamata Banerjee that she should share Teesta waters as per the formula evolved and accepted by India and Bangladesh in 2011. Mamata’s plea is that North Bengal will be bone dry in the dry season if that amount of water is released. She has rejected Modi’s suggestion that reservoirs be built to store waters during the monsoon for use in the dry season. This is probably because water expert Kalyan Rudra has said that these dams will actually cause floods during the monsoon as they have to be opened up to prevent them from bursting. Mamata has suggested that Bangladesh tap the waters of five other rivers which cross the border. Hasina was disappointed with Mamata’s stance but felt gratified that she had agreed to give electricity. The second controversial issue bedevilling Indo-Bangla relations is the defence pact. In 2016, seeing China deliver two submarines to Bangladesh, the then Indian Defence Minister, Manohar Parrikar, rushed to Dhaka to persuade Hasina to come to India for weapons and not go to China. He proposed a 25-year Defence Pact encompassing a wide range of joint defence activities. Bangladesh has been dependent on China for its defence equipment to the extent of 80% since 1971. But the purchase of Chinese submarines was the last straw on the Indian camel’s back as Chinese naval presence in Bangladesh could threaten India’s dominance in the Bay of Bengal. However, understanding India’s sensitivity in regard to China’s intrusions into its “sphere of influence”, Hasina signed a MoU which includes assistance of $ 500 million to help Bangladesh buy Indian military equipment. But it is not a 25-year treaty, as India initially wanted. There is political opposition in Bangladesh even to this limited deal. The Indian offer is seen as a ruse to palm off sub-standard weapons. In Bangladesh, Chinese weapons are seen as being cheaper and better. Bangladeshi commentators have also asked how India can sell weapons when it itself imports weapons to the extent of being the single largest importer of weapons in the world spending $ 24 billion. India depends on imports to meet 75% of its needs. China, in contrast, is an exporter, selling more weapons that either France or Germany. It accounts for 6% of the world’s arms sales. India is nowhere in the picture. However, India has plans to beef up defence production with international collaboration. In January this year, the then Defence Minister Manohar Parrikar said that India exported $ 300 million worth of defence equipment and hoped it would take a quantum jump to be $ 2 billion by 2019. To attract foreign investment in its defence sector, the Government has allowed foreign partners to take a 49% stake in defence industries. Military contracts up for grabs are now worth $ 130 billion. Between January 2001 and February 2016, the Indian Commerce Ministry had granted 333 industrial licenses to private firms for defence-related manufacturing. But ‘Make in India’ projects may take a long time to fructify. Over the next five years, meaningful indigenisation may not take place, except in the field of radars and missiles. As with India, Bangladesh has a huge trade deficit with China. Bangladesh buys $ 6.8 billion worth of goods from China but China buys only $ 401 million worth of goods from Bangladesh. But this is not an issue which rankles Bangladeshis. China’s rail and road projects in Bangladesh cover 21 districts and add 1.2% to its GDP growth. Chinese investments cover coalmines. The Chinese are eyeing the abundant natural gas resources in Bangladesh and could take over garment factories which are facing a tough time, with the international community lambasting them for low wages and appalling safety standards. The importance of the garment industry in Bangladesh lies in the fact that it accounts for 80% of the country’s exports. With wages in China being seven times more than in Bangladesh, China may move its industries to Bangladesh to take advantage of lower wages there. As for Sino-Bangladesh defence ties, Bangladesh’s dependence on Beijing has been long and stark. Dhaka imports 80% of its weapons from China and small arms are being made locally in collaborative ventures. So far, China has supplied to Bangladesh two diesel powered Ming class submarines; five maritime patrol vessels; two corvettes; 44 tanks; 16 fighter jets and surface to surface and surface to air missiles. While China is neutral as far as the two parties, the Awami League (AL) and the Bangladesh Nationalist Party (BNP) are concerned, it is said to have exceptionally close ties with the Bangladeshi armed forces due to long standing training and weapons sales programs. This is reflected in the Bangladesh military’s opposition to any defence deals with India, especially long term deals. Heidelberg University’s Dr. Siegfried Wolf has warned that closer defence ties with China will only increase the power of the Bangladesh military vis-à-vis civilian authority. This is considered dangerous in the context of Bangladesh’s history in which there has been a plethora of military coups and military-run governments. Pro-Chinese or pro-Pakistani Bangladeshi military will also exacerbate tension with India, Dr. Wolf warns.